· Provide relief within 2-3 days, weeks for maximum results. 1. Lay down on your back with one hand on the chest and the other hand on the abdomen above the belly button. 2. Inhale through the nose, exhale with the mouth open, moving only the abdomen (think of inflating/deflating a balloon). 3. Feel the abdomen slowly rise and fall with each breath while the chest and shoulders remain still. 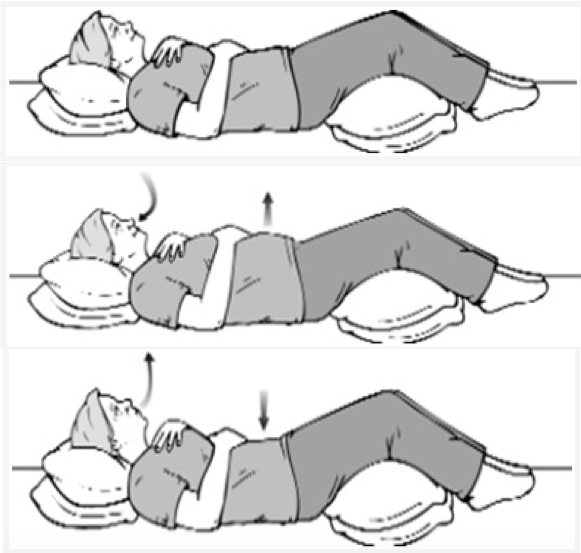 Completely inflate and deflate the abdomen with each breath. 4. Count to 4 with each inhale, hold the breath for 4 counts and count to 4 with each exhale. Extend the exhale to 8 counts gradually. 5. The same exercise can be done sitting and standing. 6. Perform this exercise for 30 breaths or 5 minutes, 3 times a day or for 5 minutes when symptomatic.